I work as author, independent scholar, and consultant in animal rights. Although I do not have any professional or academic qualifications, my personal commitment and professional involvement with the international animal rights movement since 1976 qualifies me as an animal rights activist and theorist. In 2005 I cofounded with Ken Shapiro the Animals and Society Institute. Since 2012, I have volunteered as the Executive Director of Minding Animals International, which organises the preeminent triennial international animal studies conference. My work as an independent scholar also includes lecturing and and writing. I serve to act as a bridge between animal advocacy and animal studies. Starting from the mid-1970s when I became a vegetarian and, two years later, a vegan and began my career with some of the world’s foremost animal rights organisations, I have collected various publications and materials about the moral and legal status of animals. They subsequently grew to become the Kim Stallwood Animal Rights Collection. 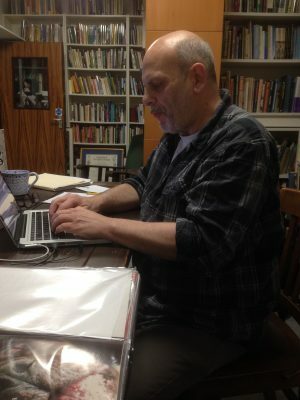 This is a unique library and archive which includes books, newsletters, magazines, journals, ephemera, videos, reel-to-feel footage, and art. There are unique and rare individual pieces as well as collections. They reflect the range and extent of my personal commitment and professional involvement in the contemporary animal rights movement. The collection is privately held in my office in Hastings, East Sussex, UK, which is my permanent residence. I use the collection as part of my work as an author, independent scholar and consultant. Expressions of serious interest to purchase The Kim Stallwood Animal Rights Collection are invited. Prospective purchasers will be given special access to private pages on this website to learn more about the collection. Please contact Kim Stallwood for more information.